This promotion has now ended, see the latest Intel Master Key promotions here! We’ve teamed up with Intel and designed a whole new range of IEM Certified Gaming PC which not only provide excellent performance for PC Gamers, but also qualifies you for a special INTEL MASTER KEY which can be used to unlock a range of BONUS GAMES! Purchase any GGPC IEM Gaming PC from PB Tech and then use the contact form to register your build and the team will send you a special Intel Master Key. Once you’ve got your Intel Master Key simple visit the Intel Redemption Site and enter your key, from here you’ll be able to access codes for the games included in this promotion! A new addition to the IEM GGPC games lineup, Counter Strike Global Offensive is a well-known team vs team shooter that plays a big part in the Intel Extreme Masters competitions. The game series is currently celebrating its 19th birthday and there’s even a new UI in beta testing to check out. Take the roll of either a terrorist or counter-terrorist and compete to secure hostages, arm/disarm explosives, or just kill each other. With a thriving community of players, this one is sure to be a fine addition to your games library. Jump in and experience Warframe, the latest updates were massive and introduced wide open landscapes, all new gameplay and even more multiplayer mutant massacres. You play as a Tenno, a mighty warrior with both blade and gun: master of the Warframe armour. Those that survived the old war were left drifting among the ruins. Now they are needed once more. The Grineer, with their vast armies, are spreading throughout the solar system. A call echoes across the stars summoning the Tenno to an ancient place. Warhammer: Vermintide 2 is the sequel to the critically acclaimed Vermintide. Team up for the fiercest first-person co-op slaughter featuring visceral and ground-breaking melee action. Set in the apocalyptic End Times of the war-ravaged Warhammer world, you will be challenged like never before as you and your team of heroes face untold enemy hordes in a desperate struggle to save the Empire from devastation. Choose a career for your Hero, customise the talent tree, choose and craft a vast range of unique weapons and gear then hack you way through the ranks of monstrous invaders! Dreadnought puts you in command of massive capital ships for tactical, team-based warfare in space and across the skies of different planets. As a mercenary captain, your motivations are simple: to reap the rewards of battle and build your reputation – and to be fearless doing it. Armed with earth-shaking weapons and the support of your teammates, you must claim victory by outmaneuvering, outshooting and outclassing the opposing team. Prepare yourself. It’s time to take the helm. A unique fusion of a top-down shooter and tower defence strategy. You are the X-Morph – an alien species that invades Earth to harvest its resources and terraform the surface. Strategize in the build mode by carefully selecting various types of alien towers or throw yourself right into the heat of the battle. Build mazes for incoming enemies in an environment that provides exceptional planning freedom. Tear down buildings and collapse bridges to support your defence or to simply indulge in a spectacle of unprecedented destruction. Possess a range of unique alien weapons and use defence strategies like you’ve never seen before in this genre. A favourite here at GGPC, Fractured Space in a MOBA style game with massive starships much like Dreadnought above, but with a very different play style and unique battle mechanics. Fractured Space is an award-winning free-to-play space combat game. Fight in co-op PvE or 5-v-5 PvP. Brought to life in the stunning Unreal Engine 4, giants of interstellar conflict fight in spectacular close quarter battles for dominance. Pick a manufacturer, choose a class and customize your weapons. Through experience, you gain the right to command more ships while earning credits to add them to your fleet. Tailor your craft to your combat preferences with crew and weapon loadout options then take on your specialized role when your interstellar juggernaut warps into battle. In This War Of Mine you do not play as an elite soldier, rather a group of civilians trying to survive in a besieged city; struggling with lack of food, medicine and constant danger from snipers and hostile scavengers. The game provides an experience of war seen from an entirely new angle. The pace of This War of Mine is imposed by the day and night cycle. During the day snipers outside stop you from leaving your refuge, so you need to focus on maintaining your hideout: crafting, trading and taking care of your survivors. At night, take one of your civilians on a mission to scavenge through a set of unique locations for items that will help you stay alive. Make life-and-death decisions driven by your conscience. Try to protect everybody from your shelter or sacrifice some of them for longer-term survival. During a war, there are no good or bad decisions; there is only survival. The sooner you realize that, the better. The ever-growing range of GGPC IEM Gaming PC are available now (look for IEM in the name and the signature gold badge), each providing remarkable game performance and those sweet bonus games, keep reading for more on the latest intel Extreme Masters event! Now, more about the IEM Event! Upon entering the event center you’re now greeted with a focused range of things to do, I counted 7 sets of gaming PC’s setup right in the foyer, with most following a 6v6 layout and several offering 4v4 VR experience, with an additional 2x setups for VR racing specifically and another two (or was it three) offering a room scale HTC Vive Pro experience to a check out – commentators off to the left were chanting HyperX – who seemed to be running a constant stream of giveaways and off to the right was a similar setup from Acer. Cut right through the middle and you have the choice to head left, for a host of food and drink options or right for even more interactive gaming zones, having already enjoyed a big breakfast we headed right continuing along at short distance till the oval passage opened up into another large hall, this one populated by a full eSports event stage which at our time of arrival looked to be jamming some Starcraft 2, Vodafone was to the right and a massively impressive stage in the theme of CS:GO map dust was off to the left with additional Intel game stream stations along the way at which you could talk shop with streamers and see how they configured their setups for this relatively new form of social gaming. The large CS:GO themed station provided even more PC VS setups for eager players to jump on and have a go – the theme of the event was clear – mini eSports competitions were taking place all over with quick prizes available for everyone – two team captions would choose players from the crowd and they would face off in a series of short games for a prize, much like in the Intel main event taking place in the grand auditorium each night, but accessible to all. 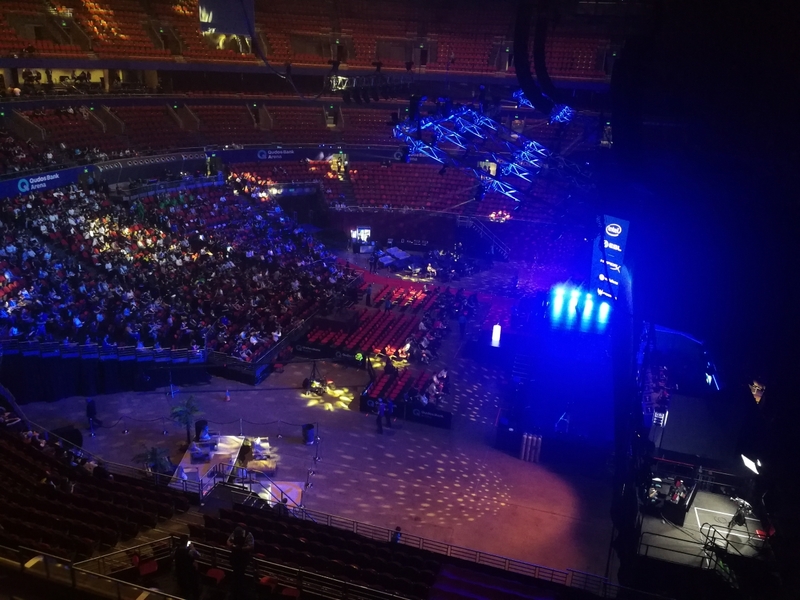 In the early afternoon the main doors opened and the crowd began to flow in through the gates for the main events – top tier teams facing off against each other in fierce CS:GO competitive matches – and this was a tournament full of surprises, upsets and crucial clutch moments. 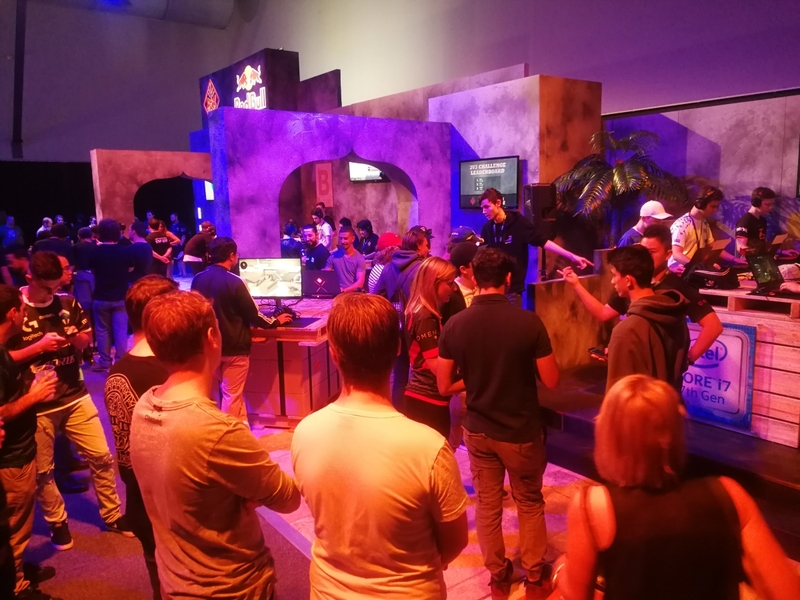 All up it’s hard to choose which part we enjoyed the most at IEM Sydney 2018, this one was so much more than just the main event and we certainly hope that Intel continues along this path with the next, which we’ll certainly to flying over to Sydney for yet again!